Meet Captain Falsebeard and Admiral Swinetoes, bitter enemies of the briny blue! Captain Falsebeard has stolen the legendary Crossbone treasure from right under the nose of his sworn enemy, Admiral Swinetoes. To celebrate, Falsebeard and crew are taking some much-needed shore lea... read full description below. Meet CAPTAIN FALSEBEARD and ADMIRAL SWINETOES Bitter enemies of the briny blue! When Captain Falsebeard discovers the legendary Crossbone treasure, he and his crew can't believe their luck! Until, that is, Falsebeard's arch enemy -- the dastardly Admiral Swinetoes -- determines to steal the booty -- by any means possible. 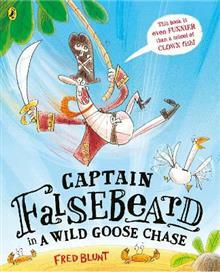 This first picture book by hilarious new storyteller, Fred Blunt, is a swashbuckling tale of battling pirates, stolen treasure, mermaids and -- parrot poo! Fred never wanted to be an astronaut or drive a train when he grew up. Right from the beginning he knew he wanted to draw silly pictures of a living . . . And some decades later he's living the dream! Interrupted only by tea breaks and toddlers, Fred works from his home studio in Swindon, Wiltshire, UK where he lives with his wife and two young children. 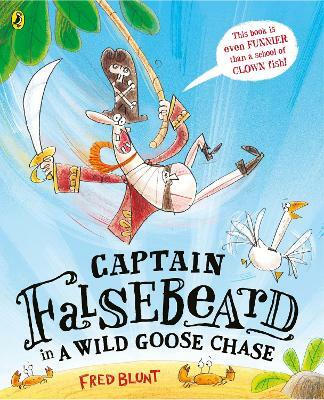 Captain Falsebeard is his first picture book.